Only use approved chargers with your watch. Use of incompatible chargers may damage it. 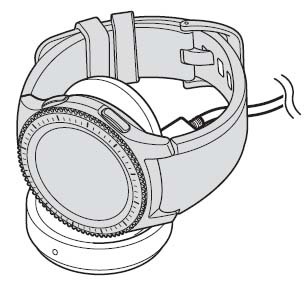 It's recommended to fully charge the watch prior to turning it on. Connect the USB cable to the USB power adapter then plug the adapter into a wall outlet. Place the Gear S3 onto the wireless charger dock. 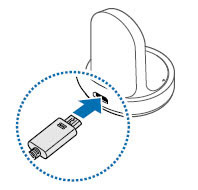 For best results, use the Samsung adaptor plug provided with the unit.